In this edition of Graphic Intelligence, we show the impact of the recent Public Accounts of Canada's restatement of the present value of future federal employee pension obligations as of March 31, 2017. Showing the obligations of unfunded pension plans at fair-market value (now discounted at current bond yields) increased total federal debt by $34.5 billion at the end of fiscal year 2016/17. Because Ottawa smooths the impact of these changes in its annual financial statements, it added $19.7 billion to its accumulated deficit that year: the remaining $14.billion will negatively affect the bottom line over the next 10 to 15 years. As pointed out earlier this year, Ottawa's pension liability is undervalued by about $100 billion. The recent restatement applies only to the obligations of its unfunded plans – pensions accrued before April 2000 – and the plans for federally appointed judges and Members of Parliament, as well as benefits above Income Tax Act limits. As argued in Ottawa Comes Part-Way Clean on its Pensions, Ottawa did not go far enough. All its pension promises are alike, and all should be discounted the same way. If it had followed the logic of valuing all its pension promises like other government debt, accrued federal pension obligations and the debt numbers in the 2016/17 financial statements would have been at least $80 billion greater – represented by the top patterned area in the Chart above. 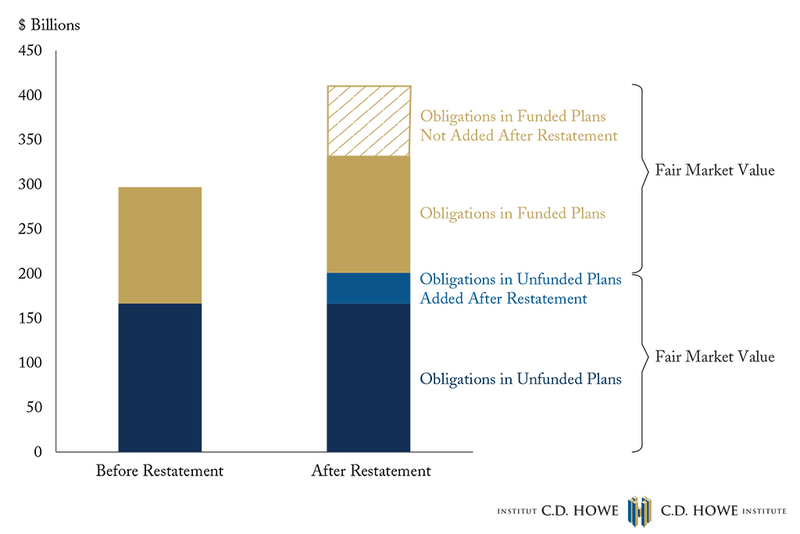 The restatement of pension obligations in the federal government’s unfunded plans is a step forward for transparency. A key task that remains is to demand that the government come clean on the value of all its pension promises. To learn more about the restatement and its impact to unfunded obligations, read “ Ottawa Comes Part-Way Clean on its Pensions” by Bill Robson.